Reading this book was certainly an entertaining experience. Margaret Taylor, wife of Zachary Taylor, actually prayed every night that her husband would not get elected President. She felt his health was not up to the job and she was proven right—he died after barely a year in office. Eliza Johnson, wife of President Andrew Johnson, was so frugal that she even bought cows to graze on the White House lawn in order to provide fresh milk. Lucy Hayes and her husband Rutherford Hayes were not exactly the fun-loving party types. They banned liquor in the White House, forbid card-playing, dancing, and even playing pool. Lucy filled the White House billiard room with plants. Unlike most first ladies, Eleanor Roosevelt had no interest in preparing elaborate meals for guests. In fact, when the king and queen of England came to visit Hyde Park, Eleanor served them hot dogs. President James Garfield was an unrepentant womanizer. He even had the gall to introduce his wife Lucretia to some of his mistresses. Talk about a miserable marriage. As a husband, Lyndon Johnson was a dictator. For this I will quote the book: “Lady Bird was directed to shine his shoes, bring him breakfast in bed, keep his cigarette lighter filled, and more. . .He also insisted that she learn about his job, assigning her names, addresses, and other details to memorize. And as if all that weren’t challenging enough, she had to deal with the rumors about her husband’s extramarital affairs.” Poor Lady Bird! 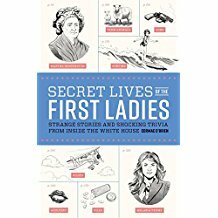 There is much more to read in Secret Lives of the First Ladies. Every chapter gives the reader a fascinating glimpse of each first lady, giving a sense of their personalities and characters. My one criticism: Author O’Brien is obviously not a Trump fan. His description of First Lady Melania was the only one that was downright unflattering. I didn’t appreciate the mud-slinging and lack of civility of today’s partisan politics in her description. So glad you mentioned that the author was not fair to Mrs. Trump. Had thought the book would be something I would read but have decided I will not buy it. Perhaps you might let the author know that many are tired of writers, actors, professors, etc. pushing their political ideologies on the unsuspecting. Patricia, I believe the author was not fair to Mrs. Trump. I pointed that out, but other than that, I do believe the book was a very entertaining read and do recommend it.